The Original Carport-in-a-Box. Easy Assembly. Our 12' x 20' x 8' Carport-in-a-Box is a built for warmer climates where optimal air flow and shade are needed. Like our garage and shed products, the Port-in-a-Box is constructed with high grade steel. Every frame pipe and connector goes through a proprietary 13 step Rhino Shield Surface prep process. Heavy duty 2" all steel frame is bonded with Dupont baked on thermoset powder coat process prevents chipping, peeling, rust and corrosion. Advanced engineered, triple-layer, chemically heat bonded enhanced quality weave, rip-stop, waterproof, polyethylene cover. UV-treated inside and out with added fade blockers, anti-aging, anti-fungal agents resulting in a fabric cover that withstands the elements. 2" diameter 17-gauge steel tubing with gray powder-coated finish. 4 Rib framework with slip-fit connections for easy bolt together assembly. 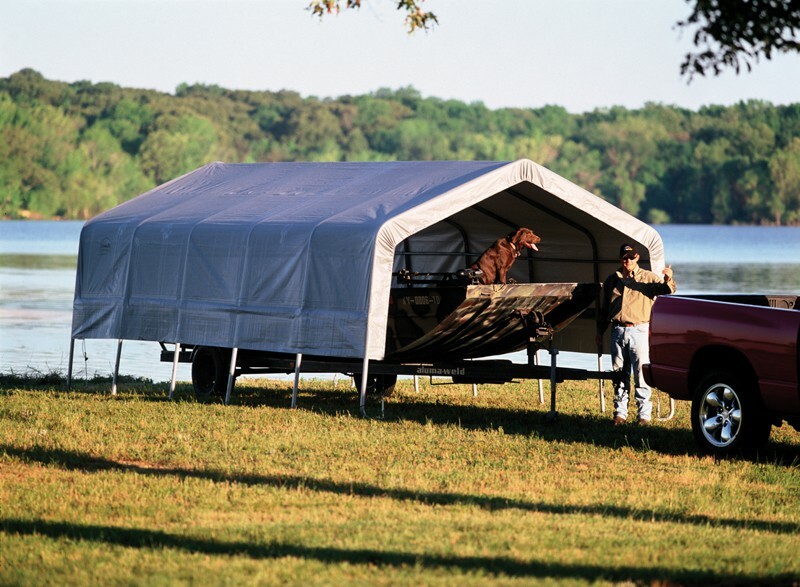 Great For: Seasonal protection and shade, boat, vehicle, ATV's PWC's and bulk storage. - 7.5 oz. UV protected Polyethlene fabric. - 3-layer all-weather Rip-stop fabric. - White interior lining for enhanced illumination. - (1) 12' x 20' x 8' All steel frame. - (1) One-piece, fitted polyethylene cover. - (4) 15" Auger anchors. - 1 Box, Total weight: 177 lbs. Availability: Usually ships in 3-7 business days.